← Desperate coca grower’s gov is seeking new ways to tax us! 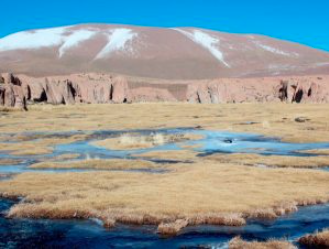 The waters of the Silala come from springs located on Bolivian soil ratified a technical – geological study conducted in 2016, by the Autonomous University of Tomas Frías, Potosí. A team of Potosi professionals and university students moved to Silala to study “fractures” (in geology is the separation under pressure in two or more pieces of a solid body), land and all aspects related to geology. The thesis, with geological evidence and maps, supports the theoretical assertions of the Bolivian authorities and rebut the position of the Chilean government. Another confirmation of a crystal clear fact! This entry was posted in Bolivia, Environment, Politics, Potosi, Social Unrest and tagged Chile, invasion. Bookmark the permalink.